One of the parts of my foyer makeover that I needed to address, but haven’t shared before, is the dead space at the top of the stairs. The area is visible when anyone enters our front door, so I didn’t want to leave it as just a blank, blah and empty space. Plus, there were the remains of an old smoke detector and a round metal plate attached to the ceiling (for who knows what reason) that needed to be gotten rid of. My eye went straight to that spot every time I looked up. There isn’t lot of room to work with in this spot, that’s for sure! I played around with a few different things using tables that I already own and even considered building another bench similar to the ones in my foyer, but all of my tables were too deep and I really didn’t want another bench in this area. Plus, the thought of all those legs and spindles was too much. What this area was begging for was a tall’ish, narrow chest in a soft blue color! 😀 You can purchase this same chest HERE (affiliate link, see my full disclosure HERE). It’s on sale right now for $50 off! The chest is only 12″ deep so it gives us plenty of walking room. It’s a little taller than many small chests, which makes it more visible from the downstairs area of the foyer and all of the drawers will come in handy. I am in total LOVE with this adorable light fixture – it’s a great addition to this space! It blends right in with the new foyer chandelier (which I haven’t shared yet) and the sconces that I added to the board and batten wall down in the foyer. The light fixture can be purchased HERE. What had me stumped for a few days was what to hang above the chest. A grouping of pictures would have been too much, considering that I’m already adding a gallery wall going up the steps. (You can see a portion of the gallery wall in the above photo.) And since all those frames are going to be filled with pictures of some kind, I wanted something different above the chest. An old, chippy frame out of my attic and a boxwood wreath proved to be the solution! I’ve talked about the importance of the small things before, so this little bit of black and white ribbon, that the wreath is hanging from, helps to reinforce the black and white of my banister and the black picture frames that will make up my gallery wall. The boxwood wreath is 21″ in diameter and can be purchased HERE (affiliate link). 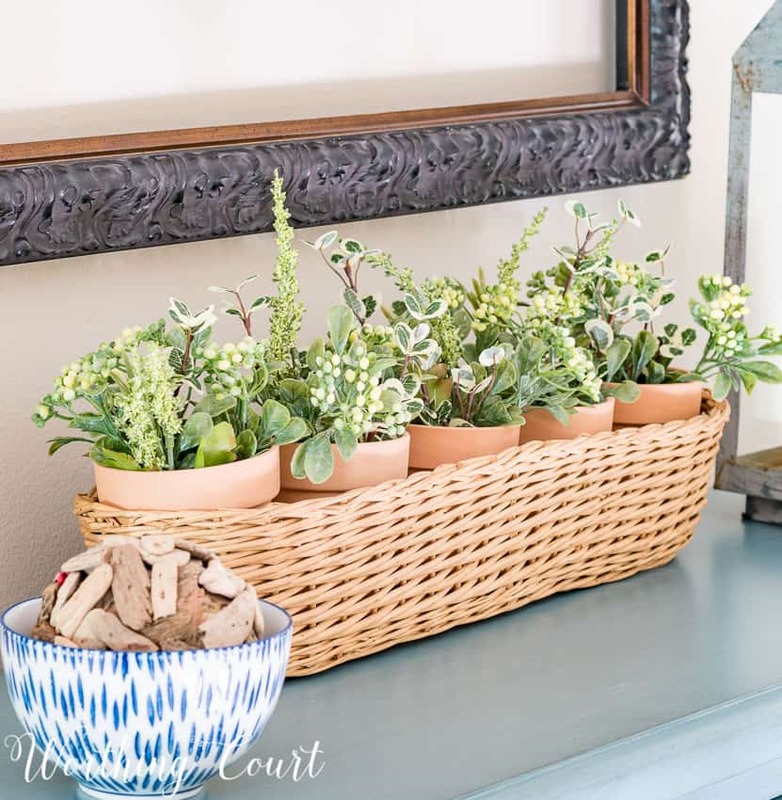 To create a greenery arrangement, I filled a thrifted basket with clay pots from the dollar store (two for $1!) and filled the pots with foliage clipped from artificial greenery bushes. Easy peasy and very inexpensive! Do you have any dead space in your home that you could add a small chest too? Love, love, love the blue chest! What a great addition for your hallway! What a great looking chest! It is perfect for that space. By your light fixture (which looks amazing in that spot), I’m guessing your chandelier will be #2 choice as well. Can’t wait to see it! Love the look! and love that you used a lot of what you already had! Love the blue chest!!!!! Well done! I have a blue chest just like that . I use it in my hallway next to my stairway and I love it. Yours looks great in your dead space and I like the boxwood wreath. Looks great, I love your choices. You always make it look so easy!! Love the blue chest. It is perfect for the space. Love how the space turned out. 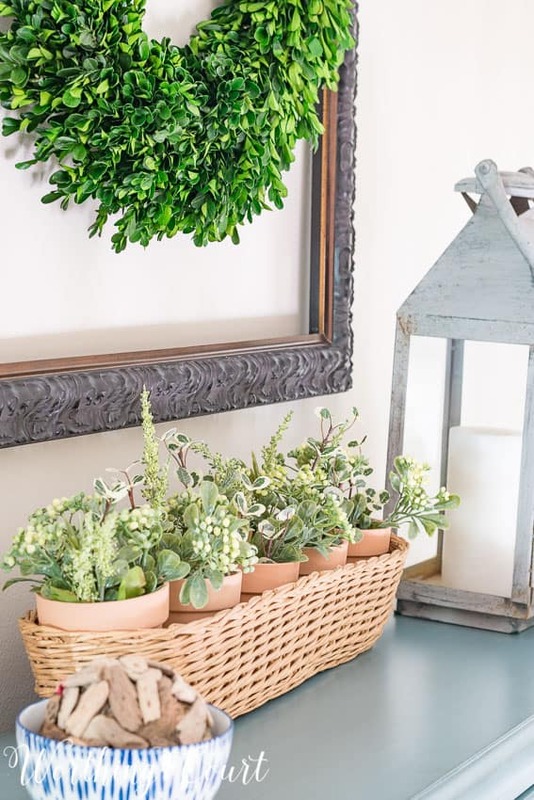 And, might just have to copy your sweet faux greens arrangement. It will be the perfect addition to my table that is at the top of our foyer. Looks great!!! You did a really nice job in a problem area. Thanks for sharing your ideas. What an awesome solution – looks great! I need a narrow chest in my dining area, but am hoping to find an antique something. You are lucky to have found one so narrow. It looks great. Beautiful! Love the blue chest. Thanks! I have this problem area too. The stairway has a small platform and turns right to three last stairs. Always bugs me. Now I can fix it!! What a wonderful blue chest! I love that it’s not very deep and have the perfect spot for one also. Thank you! I love the chest and the boxwood wreath above it! It fits just right in that space!! It’s amazing how transformed the hall became. I have a similar shorter hall and it always bugs me. And I also have a remnant smoke alarm too. I’m inspired by your beautiful color choices. I recently made a fresh bay leaf wreath …it may have found a new home!! Very clever way to use dead space! And I’m with you….I try to be careful if I have a bisy wall and balance it with a simpler wall..good job! Looks great! I am going to copy your wreath and frame idea. I happen to have an empty wood frame and boxwood wreath. I am going to try them on a large family room wall space that has been bothering me. Thanks for the great ideas! Love this – especially the blue chest! We have almost the exact same space in our home, so this is a great idea for me to implement in my home! Love what you did to make that dead space so ALIVE!!! Suzy you really nailed it. That long and narrow space is now pretty and functional. Totally love this. What a creative idea! 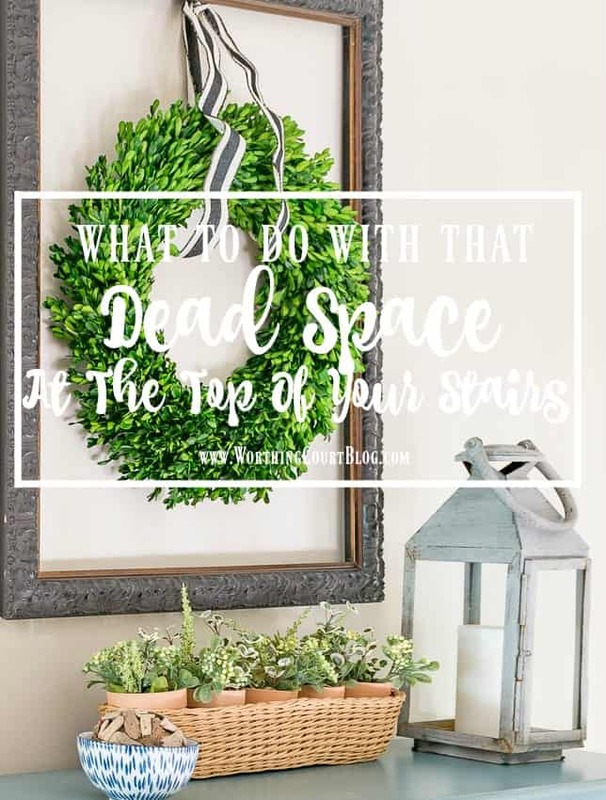 I too have some dead space in my house, and your idea is amazing! The “hallway” at the top of the stairs is so much more interesting, now. Without taking up too much walking space, you added color, shape, heft, and texture to liven up the space. 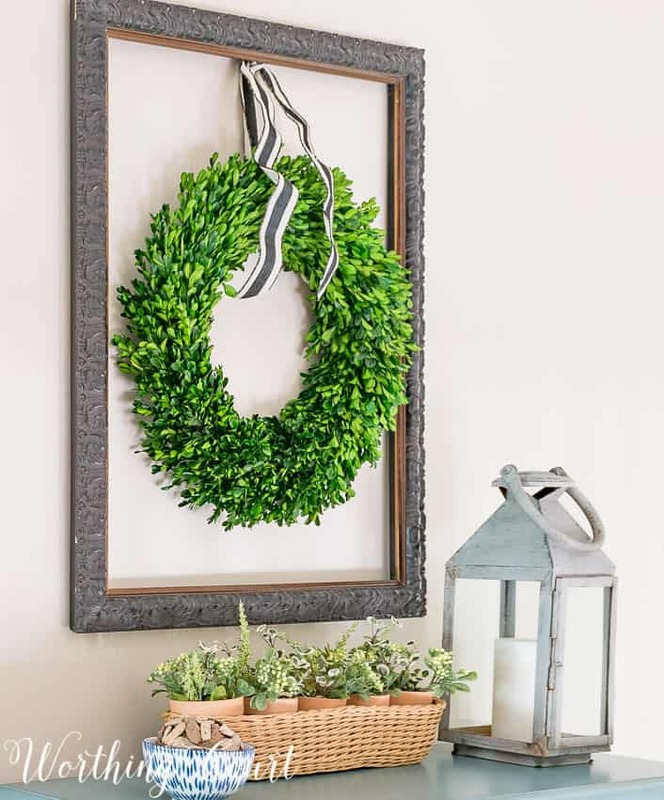 The wreath in the frame is especially striking, as it adds dimension, shape, and an element from nature without adding weight to make the grouping too top-heavy. Very nice! 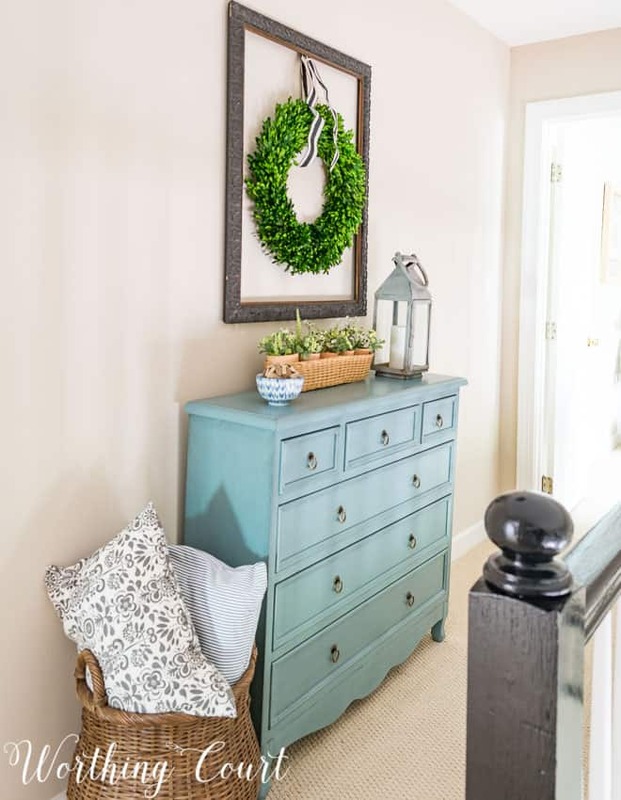 The chest is perfect for the space and the boxwood wreath hung in the old frame adds the perfect accent to your design. I have a tall vintage mahogany secretary at the top of my staircase but the pop of color that you get from your blue chest makes me wonder if I should consider painting my secretary. Great solution to a tricky design problem. I love what you did! 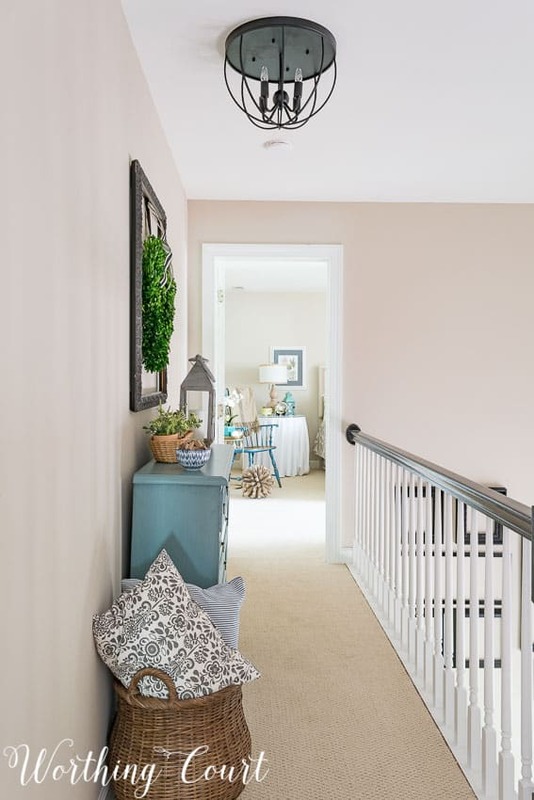 Such a lovely pop of color and style for that narrow, empty space. I am crushing on the chest. I need something similiar so I checked it out but it is a little too long for what I was wanting it for. You’ve got me thinking and looking now, though. I’m enjoying your blog. Thanks for the inspiration! I’m amazed at the difference in that space. I looked at the first picture of the empty landing, and could not come up with any ideas of how to solve the problem. You had the perfect solution and your vignette is another favorite for me! Love this! 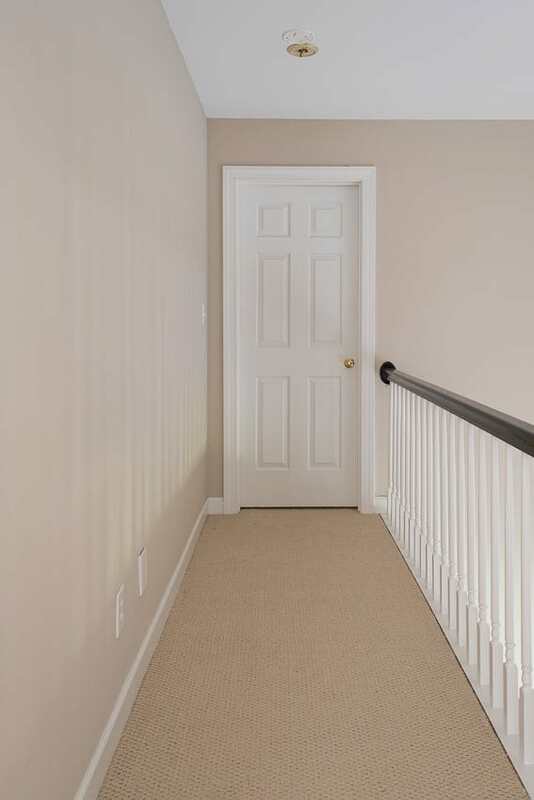 I need to do something with my upstairs hallway- great ideas!